Does Budget Transparency Lead to Stronger Human Development Outcomes? 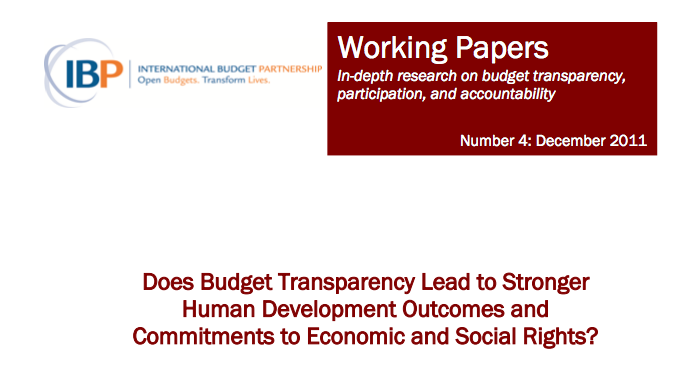 Does Budget Transparency Lead to Stronger Human Development Outcomes and Commitments to Economic and Social Rights? This working paper out of International Budget Partnership explores the relationship between the quality of the budget process and human development outcomes. Fukuda-Parr and colleagues look in particular at the relationship between the Open Budget Index (OBI) and human development as measured by the Human Development Index (HDI) and a number of related human development indicators, as well as the Economic and Social Rights Fulfillment Index that measures government commitment to economic and social rights. Their results find that OBI, overall, is a statistically significant predictor of child and infant health outcomes as well as access to improved drinking water, even when controlling for the effects of income and region.